It is easy to fall into the harmful habit of treating your dog like a baby. After all, you and your dog develop a strong emotional bond. It may seem natural to treat your canine companion as an integral part of your family, but the dog’s evolutionary path is different. Dogs have the ability to share close bonds, but their relationships don’t fit the human definition of family. Instead, canines form pack relationships that are based on respect for a leader who establishes and reinforces acceptable behavioral standards for members of the pack. As the pack leader, your responsibility is not only to teach your dog what behavior is acceptable but also to avoid reinforcing behaviors that arise when a dog is treated like a baby. The behavioral issues that emerge from this struggle for leadership can have sad consequences for both owner and dog as revealed in a 2015 study exploring the reasons behind the rehoming of dogs and cats. The primary reasons were related to housing issues and the pet’s medical needs. Many pets were surrendered when they grew out of their cute baby stage into unruly adolescence. Excessive barking and begging for food are two of the most common behavioral problems that can result if you treat your dog like a baby. While you might have become immune to your dog’s constant barking, your annoyed neighbors may file a formal complaint. This puts you at risk of a difficult decision of either surrendering your dog or finding new housing. Rewarding your dog for begging to share your human food puts its health at risk. Table food upsets the dog’s digestive system and leads to unhealthy weight gain, which put the dog at risk for other life-threatening health issues. 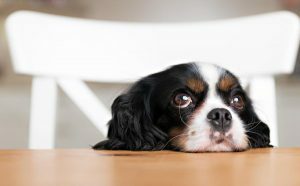 Begging also sets up the dog for unintended behavior, such as a bite if it snatches food from unwary adults or children. You can help avoid these and other behavioral problems by not treating your dog like a baby. It can be challenging to set up what you might perceive to be a barrier between yourself and your dog, especially with a cute and cuddly puppy. It is also natural to reassure and dote on an adopted adult dog when you first bring it home. A Duke University study suggests childlike ways dog behavior has evolved to meet human expectations. In another study, Dr. Stanley Coren suggests a dog’s ability to learn human language in an average home setting is equal to that of a 2- to 3-year-old child. These characteristics misdirect us into treating our dogs like surrogate children when, in fact, dogs are complex animals with an innate understanding of themselves and the world in which they live. Recognizing the difference between canine and human behavior sets the groundwork for a relationship with your dog that gives it opportunity to reach its full potential through positive reinforcement methods and effective communication techniques.